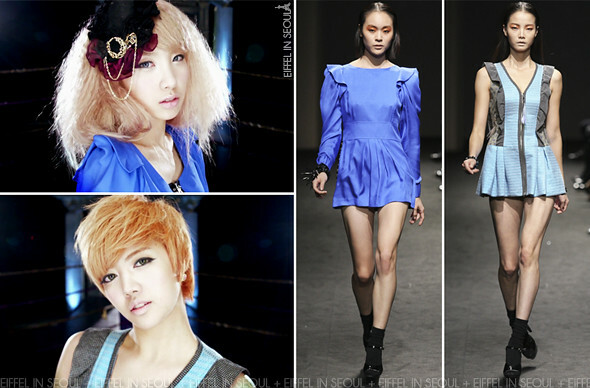 Aside from Orange Caramel, the other girl group who wore Kwak Hyun Joo Spring/Summer 2011 collection is Rainbow. The group recently released a new mini-album, So Girls on April 6, 2011. In the music video of 'To Me', 3 members of the group were seen wearing garments from Kwak Hyun Joo. Namely Go Woo Ri (고우리), Kim Ji Sook (김지숙) and Yoon Hye (정윤혜), please correct me if I'm wrong. Strutting in trench coats and embellished high heels, the ladies also carried bags from Chanel, Balenciaga, Givenchy, Mulberry and Vivienne Westwood in the music video. It should be Yoon Hye, not No Eul. The name of the short-haired girl is Yoon Hye, not No Eul. Otherwise, everything looks dandy.